The Fontinalia is a festival in honor of Fontus, the god of fountains, springs, and wells. Fontus was the presumed son of Janus by the nyph Juturna. Sacrificing, feasting, games, and drinking plenty of wine mixed with spring water would have been the theme of the day. On this day garlands of flowers were spread in decoration, especially around wells and springs. This was the birthday of Virgil, the greatest of the Roman poets. When he died he asked that his Aeneid be burned since it was not yet complete, but most fortunately his will was disregarded. The emperor Claudius died this day in 54 AD, having been poisoned with mushrooms by his wife Agrippina. He was 64. Nero became emperor this day upon his adoptive father Claudius' death in 54 AD. 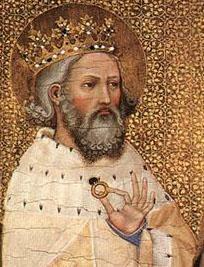 In the Roman Catholic calendar, feast of St. Edward the Confessor, aka King Edward I of England (reigned 1042 - 1066). Edward was known especially for his religious zeal and his kindliness, which moved him to spend hours a day with lepers and beggars who crowded around him for a cure, and got it often enough that "the King's evil" became the term for the illnesses that the King's touch sent away. His reign was marked by honest government, protection and service to the oppressed and the poor, civil decency and courtesy. His successor was less interested in the love and good will of his people -- and his realm fell to William the Conqueror within months after King Edward's death.